Boston's world-class universities, biotech companies, and startups often overshadow the city's thriving art community. However, there are many beautiful art galleries around the city showcasing contemporary art. Here are some of best contemporary artists in the area and the places where you can find their work. Jacob Kulin is a Boston-based sculptor. His Danish heritage has influenced his art, and he has designed sculptures for Royal Caribbean Cruise Lines and Viking River Cruises. He recently completed two large public sculptures for the city of Boston. He often uses metal and wood, and occasionally glass and other materials to form his sculptures. He strives to leave viewers with a lasting impression and designs his works to complement the space around them, tying in nature's perfection. Find his work at Logan International Airport and Symphony Community Park in the Fenway neighborhood. 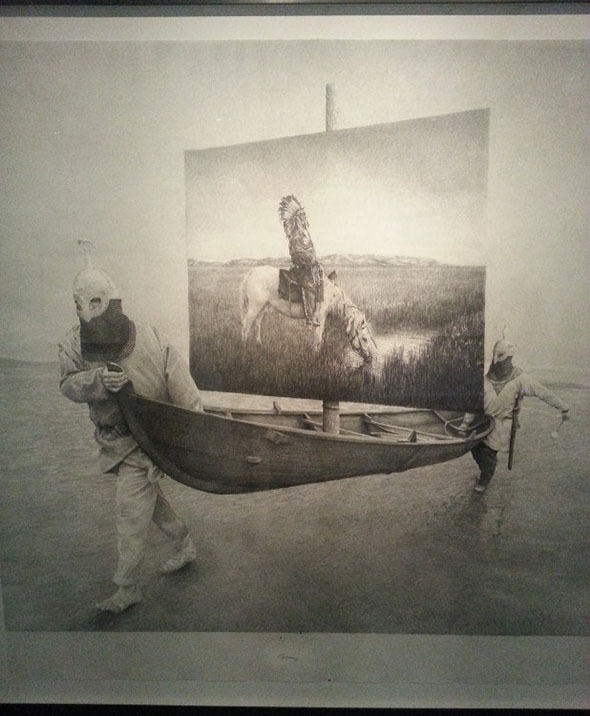 Ethan Murrow is on the graduate drawing and painting faculty at the School of the Museum of Fine Arts at Tufts University. His art focuses on America's history and how landscapes and images are essentially fiction and not reality. Using Sharpie¨ markers, his drawings are re-tellings of the nation's history, heroes, and idiots, created as detailed puzzles for viewers to figure out. His art was recently on display at the ICA, and he also did a wall drawing for Facebook headquarters in Boston. Keep up to date on his site, and look out for his upcoming artwork in New England. Carly Glovinski's contemporary art includes thought-provoking sculpture and installations. In her paintings and sculptures, she uses materials to produce incredible illusions. 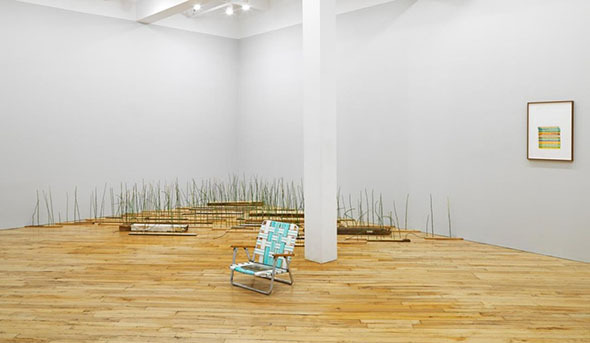 For example, in Glovsinki's work, a beach chair is likely not a beach chair; rather, it is made of folds of colored paper that will break if someone sits on it. She turns drawings into folded up plastic bags, and dish towels may actually be paper. She does not make these illusions to trick people, but rather to encourage new perceptions and a sort of double vision. Check out her art at Carroll and Sons Art Gallery in Boston. 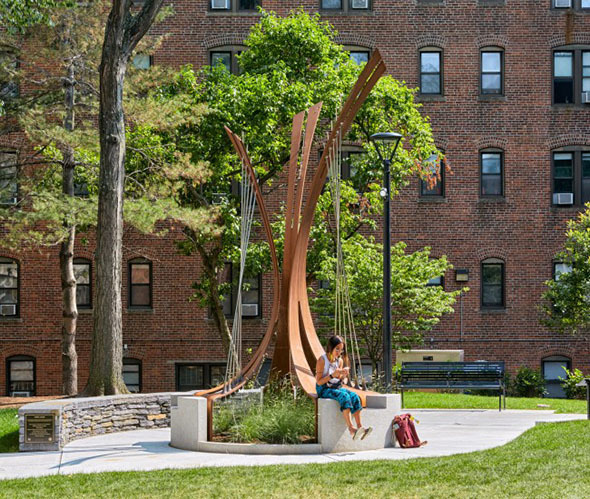 Lisa M. Greenfield is a Boston artist that creates public art sculptures and installations, as well as paintings, graphic design, and urban planning. 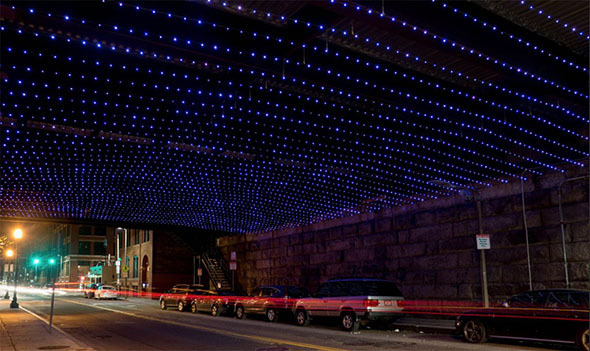 Created in conjunction with Daniel J. van Ackere, her most famous work, entitled Starry Nights, is an installation under a bridge in Fort Point; thousands of LED bulbs light up the underpass. Though the project was only supposed to be up for eight weeks, residents enjoyed it so much that it will now be permanent for the next 10 years (from 2014 to 2024). Greenfield has also had several temporary public artworks in the Fort Point area, including House of Cards and Walking on Water. Jeremy Angier is an artist who works on paintings, drawings, and sculptures many of which focus on the human body and astronauts. He created a public art installation along with Ann Hirsch, as part of A+J Design, entitled SOS: Safety Orange Swimmers. 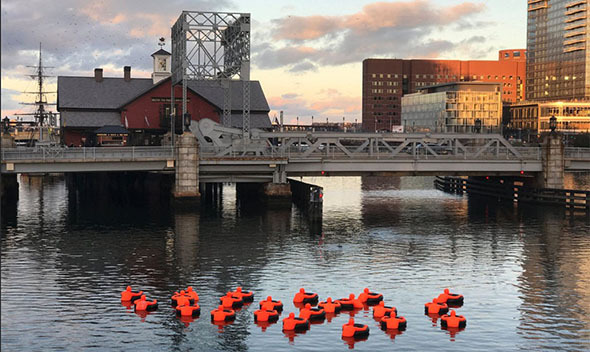 The work was shown in the Fort Point Channel during the fall of 2016 and invoked Boston's long history of welcoming immigrants. Each cast figure painted in orange buoy paint represented nearly one million refugees of the estimated 21.3 million refugees in the world. Jeremy Angier currently has a studio in Somerville that is open to the public twice a year once in the spring and once in the fall. Daniel Clayman is a sculptor that works predominately with glass. He uses technology and is interested in incorporating the behavior of lights and the memory of experience in his art. His latest installation, entitled Rainfield, involves 11,000 handmade glass raindrops suspended from the ceiling at Mass College of Art. His students in his Structured Light course helped make the raindrops and engineered their placing so that the final piece forms a Roman arch. The installation is free and open to the public, and it will remain up at least until September 2017, though it may stay up for longer. Curious about the meaning behind the work? Clayman liked that rain could mean so much to so many people, with a wide range of emotions associated with it.